On its third year, Skyathon Beach Run was held on April 21, with the route covering stations 1 to 3. 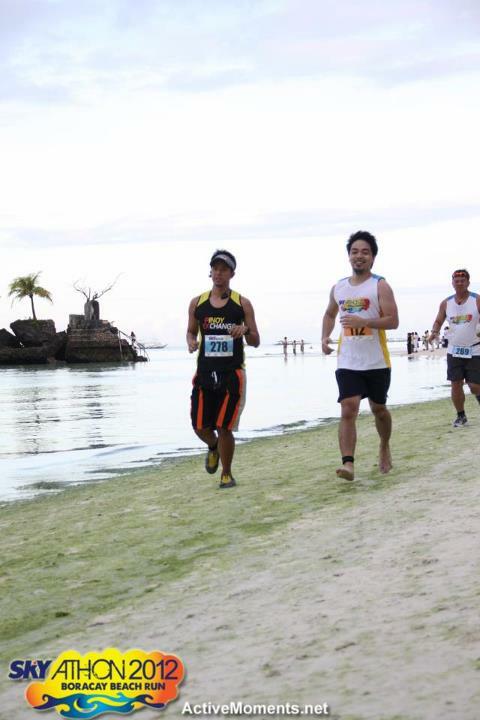 This annual fun run event is held in the efforts of maintaining the beauty of the Boracay Island. Months before the actual event, Kaye had shared something about the Skyathon 2011 and we (PEx Running Club) organized for travel in Boracay in advance. We landed in Kalibo and headed to the Boracay Island c/o our resort, La Carmela and Boracay Courtyard. We tried token Boracay restaurants and took a dip in the clear (and green) waters of Boracay. 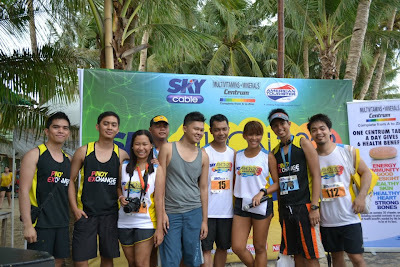 The organizers of Skyathon distributed our race kits in an event tagged as Sounds of Sundown. It started at around 3:00pm to 7:00pm and was held in front of the Epic Bar which was also nearby the starting line of the race that will be held the next day. 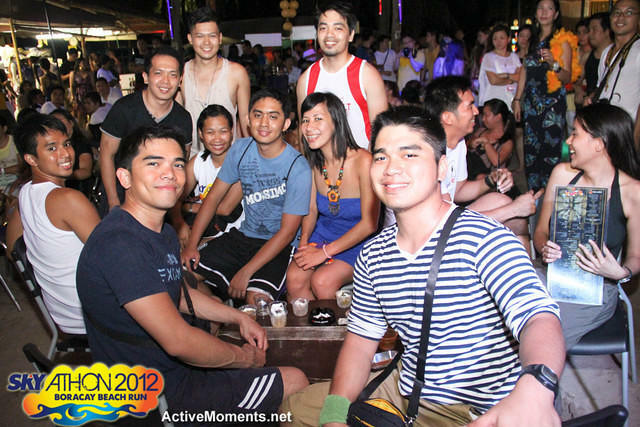 The event had us rubbing elbows with celebrities, drinking free cocktails and enjoying a beach themed program. Free Massage and Free Henna Tattoos were also offered. 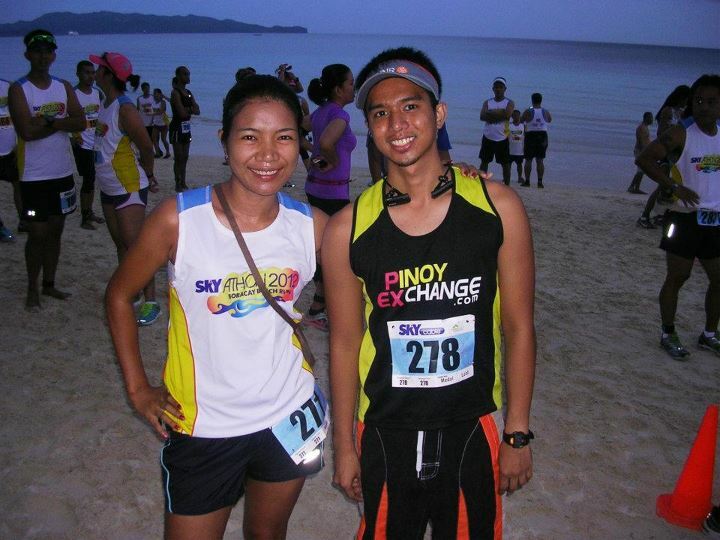 I was able to find runner friends, including multi-awarded runner, Mam Mherlz. The distribution was organized and had a relaxing feel. The queues were organized and hassle free. I got a large singlet in my kit but I was able to exchange it to a medium one that fits me better. The quality was the same one as the AXN Runs Philippines Singlet. 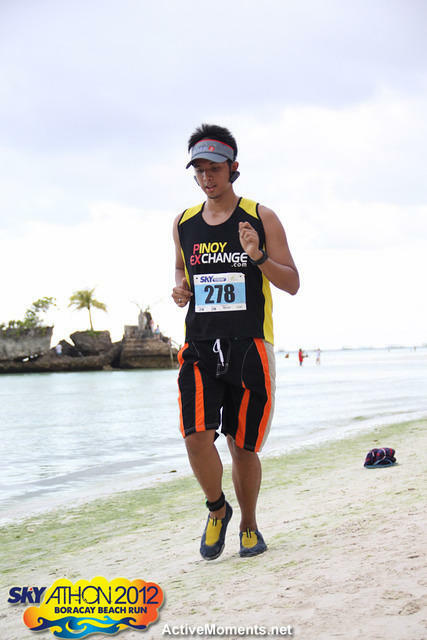 Some runners were able to get discounted rates to timing chips when rental timing chips were depleted. These timing chips can be used in upcoming Finish Lines Races. When we got up at 5:00am, it was raining so we were contemplating whether to run or not. But when everyone got ready, the sun was rising and the rain had stopped. So it will be dry run (not raining) after all. 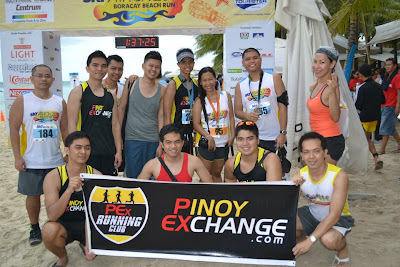 We met up with our fellow runners and took token before the race photos. Most of us were running 5k and only Dom, Jomar and I were running 10k so we were a little nervous with running on the sand in a race event for the first time. But we were determined to finished despite the new territory. I started in a slow pace and went to constant pace until we reached station 1. Running in this sand was okay but the seashore had us running unevenly. Despite the different surface though, some runners were still running at a good pace. The stretch to Station 3 felt like forever and since I was running 10k, I had to run the stretch twice so I didn't speed up even if my feet was being buried. I made it to the 2nd lap point and I had to start walking on my way back to station 1. Upon seeing running friends, I went running again. The running community indeed inspire each other to be better runners. I was doing fartlek until Station 3 but I gave up and walked when my feet was being buried in the sands of Station 3. At the last U turn, I got my feet wet and I had to take off my aqua shoes to drain out the water before running again. I finished at 1:09:36 and it was great that we had personalized medals after lining up to get my finisher's kit. The loot was also bountiful. They gave us a finisher's shirt and a bunch of other stuff that makes the registration fee all worth it. The fun run crowd was intimate so we had a number of pictures after the race. After the race, we didn't waste time and explored the activities around the island. We went to Puca Beach using ATV and rode the banana boat. After dinner, we dropped by the Gold Rush to see what was going on. They had free shots of Vodka, Tequilla and Rhum, with chicken bites. DJ Sam of Boy's Night Out was also entertaining the crowd with games and activities. We left early since the rain subsided but according to the bristles (long and thin) king (guess who), the event was even more eventful with free shots of Jose Cuervo later in the evening. The Skyahon was a great experience. We'll definitely be back next year. Nakakailang runs ka per month?